In the UK kidney cancer is the 5th most common cancer in men and the 10th most common cancer in women. Kidney cancer accounts for around 3% of all new cancer diagnoses and it’s incidence rates are steadily increasing. This course is designed to provide health professionals with a deeper understanding of kidney cancer and its treatment. We feel that it is essential that nurses have a deep knowledge of the disease and its treatment, in order to continue to provide a high standard of care for people with kidney cancer. 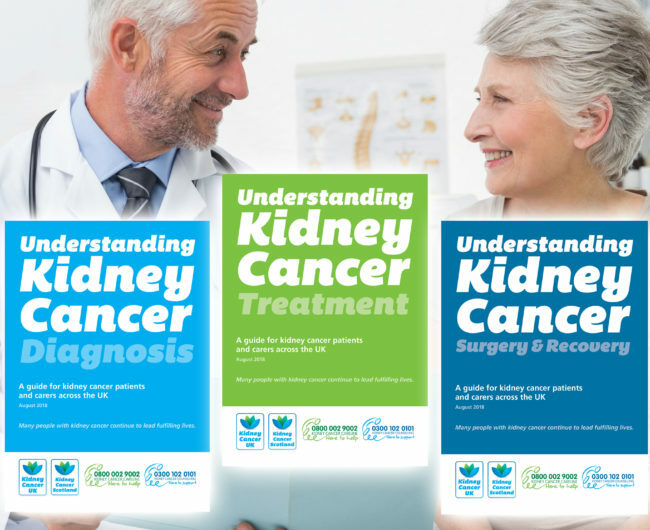 Our three critically acclaimed ‘Understanding Kidney Cancer’ booklets – Diagnosis, Treatments and Surgery & Recovery – are each available to order free of charge for use within your clinic, practice or organisation. Please complete the form here to place an order. Kidney Cancer UK is the UK’s leading specialist kidney cancer charity here to listen, inform & support kidney cancer patients carers and their families.